Andrew Nicholl was largely self-taught. 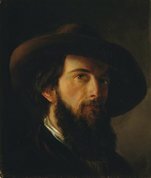 His origins were as an apprentice printer in his native Belfast, yet by his early twenties he had gained a reputation locally as a landscape painter of some note. Determined to pursue a life in art, Nicholl came to London in 1830 (before settling there a decade later) where he made copies after the old masters at the Dulwich Picture Gallery and exhibited at the Royal Academy in 1832. He also exhibited in Dublin at the Royal Hibernian Academy, of which he was elected an associate in 1837 and a full member in 1860. In 1846 Nicholl was appointed by the British Government to teach landscape painting, scientific drawing and design at the Colombo Academy in Ceylon (now Sri Lanka). 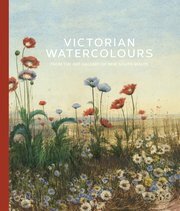 He stayed there three years and produced watercolours of the local scenery (two of which were acquired by Queen Victoria), studies of vegetation and miscellaneous sketches. Nicholl’s most important commission, from the Belfast MP and colonial secretary Sir James Emerson Tennent, was the illustration of Tennent’s authoritative study Ceylon: an account of the island, physical, historical and topographical , published in 1860. A note of idiosyncrasy and whimsy distinguishes his captivating watercolour in the Art Gallery of NSW collection – A distant view of Derry through a bank of wild flowers – which unusually combines a minutely detailed floral still-life with an expansive topographical panorama. The dense clump of wildflowers – poppies, white and yellow daisies, blue veronica – is shown growing in its natural setting, probably by the side of a road, and the artist has selected a low point of view so that we can see some of the leaves and blooms from beneath. However, the arrangement is as artfully contrived as any florist’s display, and gaps between the plants have been cunningly calculated to afford long glimpses of far-off landmarks and buildings. The city of Derry, rendered in tiny detail, can be seen in the background on the far left of the picture. More prominently placed in the composition is the wooden bridge across the River Foyle, built in 1791 by Frederick Hervey, the Earl Bishop of Derry. The presence of shipping reflects both the interests of trade and Derry’s importance as an emigration port. Although not dated, this watercolour was probably executed in the 1830s, when Nicholl painted several compositions showing a foreground screen of flowers set against a scenery backdrop, often depicting an Irish coastal town. The letters ‘RHA’ after his signature were probably added subsequently by Nicholl or another hand.